MY GROWING PASSION: The Forest of Sabine: a perfect symbiosis! The Forest of Sabine: a perfect symbiosis! I have a confession to make. Over the last year or so, the demands of study and work plus my allergies to ticks, leeches and many pollens have kept me from giving the attention to our garden that it needs and deserves. My negligence has been compounded by a higher-than-normal rainfall over summer. That disc-shaped object in the foreground of our front garden is a drowning bird bath. Many of the plants I've put in have struggled to get enough light to survive. But a month or so ago, I was in a queue for coffee at Macquarie, and noticed a woman standing near me whom I recognised by sight.... Perhaps a biology post-grad? So we started chatting, and I asked her how her research was going. Good, she said, but she was having a problem. She needed a site in Sydney to grow some plants for her PhD experiment and was having trouble finding one. What sort of site did she need, I asked. Oh, something near bushland, sandstone substrate, sandy low-nutrient soil. Hmm, I mused. How much land? 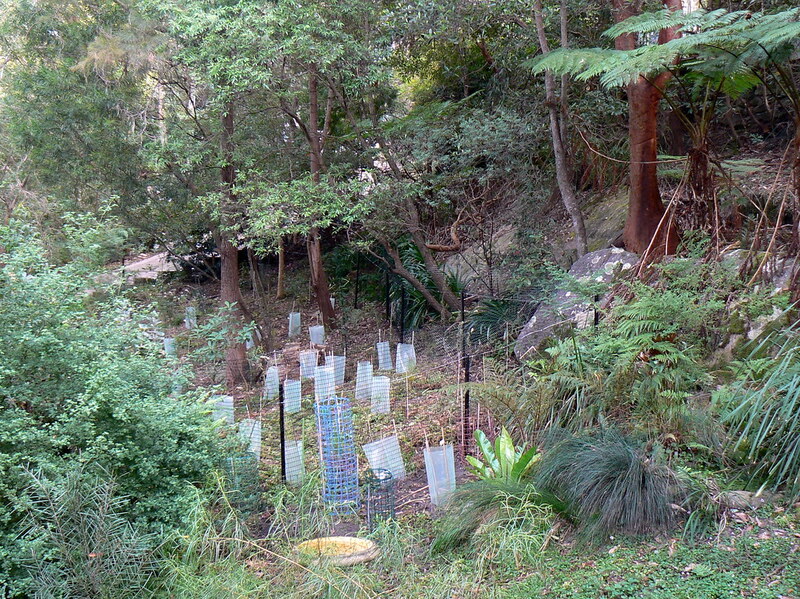 Enough to plant around eighty plants, ranging from trees to shrubs, all Sydney natives. Sabine is doing her doctorate with Professor Lesley Hughes (the Head of the Department of Biological Sciences), in the Plant-Insect Interactions and Climate Change Ecology Lab (PICCEL). You can read about her research here. As part of her work, Sabine is attempting to predict aspects of insect herbivory in the future: how plants and insects will interact as a result of climate change when Sydney's climate gets as hot as it is currently near the NSW/Qld border. She's been growing huge numbers of specimens at Macquarie University's Plant Growth Facilities (where I've studied and worked over the last year or so) for her various sites, and in the last few week or so, she and sundry colleagues/friends have been planting many of them in our front garden. This will be her control for the experiment. First, of course, she had to ensure that the soil was right. Not too many nutrients, to make it representative of the natural soils of Australia. Unsurprisingly, it passed the test. Angophora hispida (Myrtaceae), Dwarf apple or Banda in Cadigal (an Aboriginal language of Sydney). 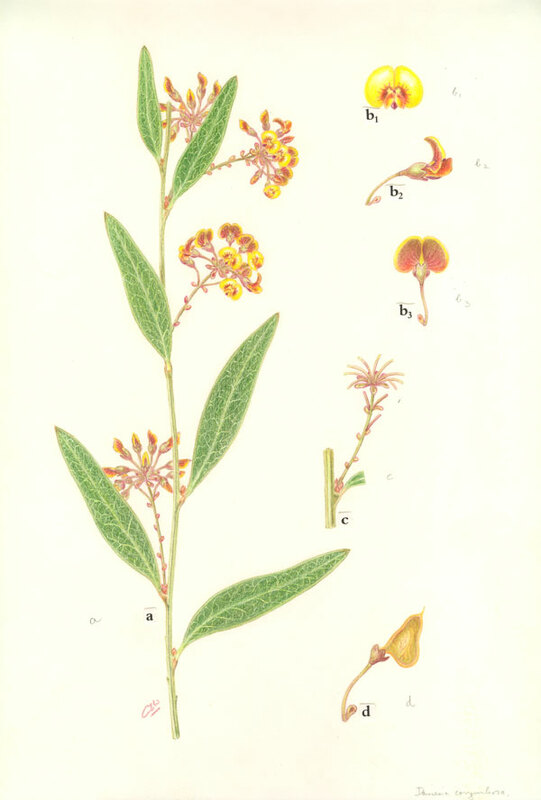 A mallee or small tree to 7 metres high. Callistemon pinifolius (Myrtaceae), Pine-leaved Bottlebrush. Decumbant shrub to 1 metre high. Leptospermum squarrosum (Myrtaceae). Woody shrub, 1-4 metres high. Daviesia corymbosa (Fabaceae), Clustered Bitter-Pea. Shrub to 2 metres high. Acacia parvipinnula (Fabaceae), Silver Stemmed Wattle. Tree or shrub, 2-10 metres high. Hakea gibbosa (Proteaceae), Needlebush. Shrub, 1-3 metres high. This species is in the same genus as a plant I recently propagated from seed, and am now growing in the garden, Hakea sericea. 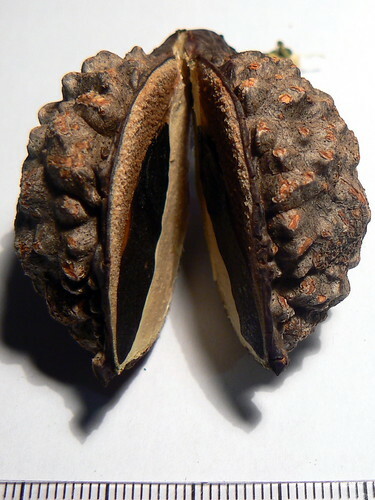 Both have similar large, tough seed-pods and seriously sharp, hard leaves. 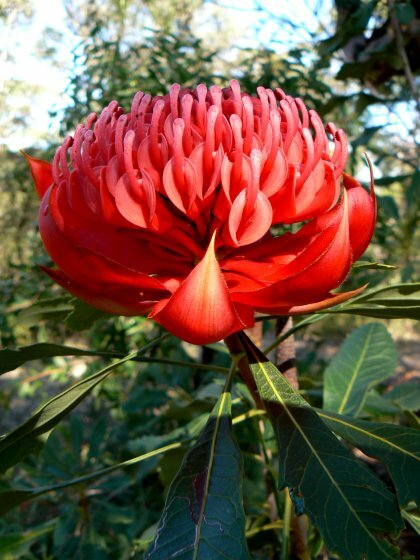 Telopea speciosissima (Proteaceae), Waratah. Shrub to 3 metres high. But she can't possibly be as thrilled as I am. All these plants! The bracken gone! What will essentially become a forest in our front yard! 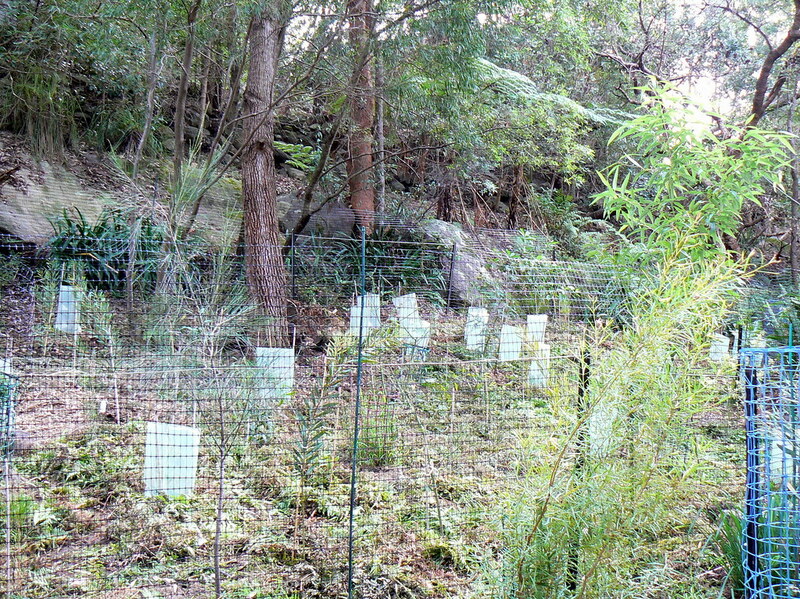 Once the experiment is finished (in around 18 months), I'm going to put in some local understorey plants. But I'm quietly hopeful that they'll emerge naturally. The soil is full of seeds of local plants, just waiting for the right conditions to germinate and grow. Finally, I think they might just get their chance. So how win/win is all that?! I'll update the process, once the plants start to take off. Watch this space, come spring. What a nice garden you will have. I think you are the lucky one. It's great that Sabine planted all this plants in your garden. I hope you make a lot of photos and you will send them to me. Thanks Jeanne! I hope next time you and Pierre come to Australia, you'll see a beautifully transformed space. I'll definitely send you photos. what a great project. I wish I had a Sabine. We purchased a large block last year and I am now trying to revegetate it with local indigenous plants. Must admit that have been very fortunate as we have a creek at the bottom and so Melbourne Water is giving us a grant of 1000 plants - tube stock to get started. At the moment it looks like a scorched earth policy because of all the weed trees that have been removed. Wow, you have a task on your hands. Exciting, though. There are few things more thrilling than restoring a patch of earth like that. Just think of the fauna you're going to attract back! I'm going to follow your project on you blog, too. Science Blogging. Why we do it.